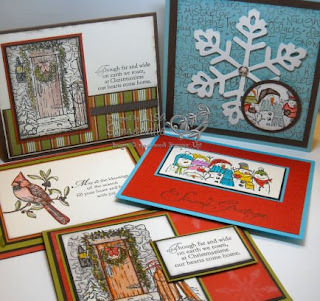 I will be offering 2 Holiday Card Classes in November- at each class you will be making 10 beautiful cards (2 each of 5 different designs, 10 different designs in all). When you attend both classes, you will have 20 holiday cards ready to mail this Holiday Season. Call or email me today to reserve your spot - space is limited. Can't attend Class? 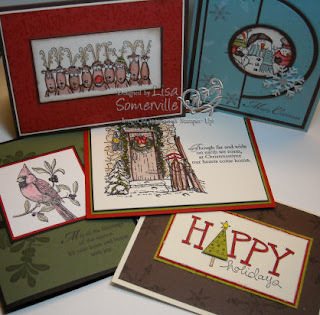 No Problem, you can purchase the Holiday Card Kits $18 EACH KIT plus $4.80 Shipping. When you purchase the Holiday Card Kits, you will receive all of the pre-cut card stock and embellishments for creating 10 cards (2 of each design shown - choose either Kit 1 or Kit 2 - SAVE on shipping when you order both kits) NOTE: no images will be stamped for you - you will receive a supply list and photo of each card with directions, so you can complete them in your own home. Email me today for more information on my Holiday Card Kits. I wish I lived near you so I could come to your Christmas card class. These are lovely! Oh me too! These are just beautiful cards!